MET Coaches provide high quality transportation services to a wide range of public and private schools, companies, social and sports clubs, and individuals. Our service covers Hertfordshire, most of North London, West London, Bedfordshire, Buckinghamshire and Berkshire. Give us a call at 01923 247765 today for a competitive quote. Located about 20 miles northwest of central London, St Albans is a bustling city in Hertfordshire. 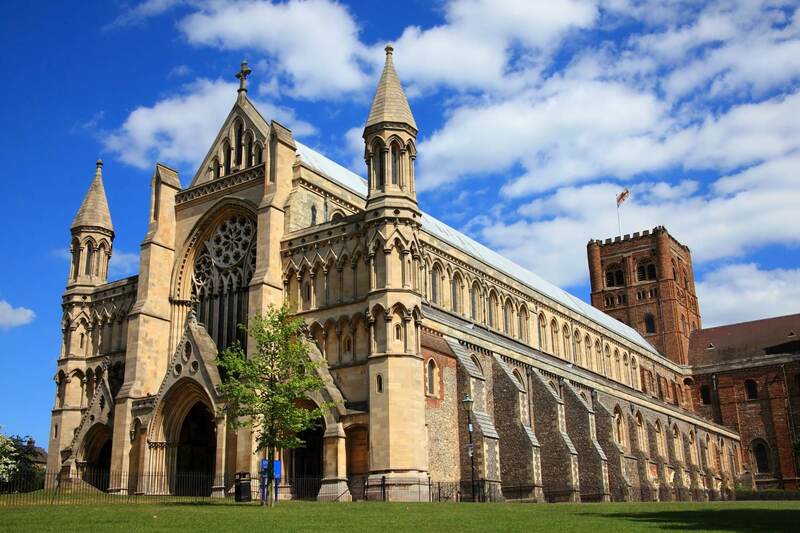 Thought to be established in the first century, St Albans was the first major town on the old Roman road of Watling. Today, it sits near to major roads including M1 and M25, and also close to landmarks like the Warner Bros. Studio Tour London (20 minutes), Hatfield House (24 minutes) and ZSL Whipsnade Zoo (26 minutes). Since 1995, we’ve served public institutions, businesses and residents of St Albans, offering reliable minibus and coach hire services at competitive rates for corporate events, schools and colleges, private trips and sports teams across St Albans. Our sizeable fleet of coaches and minibuses has a high level of luxury you and your group can enjoy. Some of our large coaches even have an onboard kitchen, toilet and a minibar. With us providing transport for your event, you can be sure to expect a fantastic transport service that is suitable for any event and always fit for purpose. Simply let us know the number of passengers you have and your destination, we will find the right vehicle to match your requirements. From corporate hospitality trips to industry conference events around St Albans or in Watford, our team will work with your corporate events planner to provide your guests and teammates with smooth transport to ensure your day is a success. For those going on international corporate trips or expecting foreign guests, you can count on us for reliable airport transfer services between St Albans and London Luton and London Heathrow airport. We also provide corporate coach hire services to top corporate venues in Hertfordshire such as the Langley Banqueting & Conference Suite. With a capacity for 100 to 1,000 people in two of their suites and a roof terrace for outdoor events, this venue is suitable for a variety of corporate events. For over two decades, we’ve worked closely with local schools and colleges in St Albans to carry out educational trips and sports days across Hertfordshire. Our fleet of minibuses and coaches has a varied capacity to suit all group sizes and at MET Coaches, we put a strong emphasis on passenger safety from start to finish. Our minibuses and coaches are serviced every six weeks and our drivers are DBS-checked and receive regular training. The College Lake Nature Reserve in Tring, roughly 30 minutes from St Albans, makes for a wonderful educational outing. Students will get to learn about local wildlife habitats and nature in a fun and interactive manner as well as enjoy lunch at their picnic facilities. You can rely on us to make your school trip a smooth one. Our reliable driver will take your students there, wait for you, and return your group to school after the trip on time. From hen nights to family days out, important private events require luxury minibus and coach transport for the day. Avoid booking multiple taxis and deciding who shares a taxi with whom. With us, all of your guests will travel in comfort and style and will arrive together and on time. Manor houses in Hertfordshire, Buckinghamshire and North London are all easily accessible from St Albans. For a venue closer to home and perfect for a special private event, Hatfield House is around 30 minutes from St Albans city centre and offers summer event packages, Christmas event packages and wedding packages. Located in Watford, the MET Coaches depot is a 25-minute drive south of St Albans. It’s why we’re able to provide reliable transport solutions to residents, businesses, and public institutions in St Albans. Give us a call today on 01923 247765, and we will take you to your events around St Albans, across Watford and outside of Hertfordshire, safely and conveniently.